Within the issue are analytic essays and editorials which cover harmonizing health disparities measurement, leveraging the data-rich world, addressing social determinants of health; designing structural, behavioral, and multilevel interventions; and building an evidence base to adapt interventions for health disparities populations. Other covered topics include methodologies to understand causes, the importance of a life course perspective, and key biological mechanisms that link social exposures to chronic diseases. This special issue is introduced by NIMHD Director Eliseo J. Pérez-Stable, M.D, and NIH Director Francis S. Collins, M.D., Ph.D., in an Editor's Choice editorial. The science visioning is a transdisciplinary effort that bridged scientific disciplines to develop a coordinated research vision to improve health and reduce disease in populations that experience health disparities, e.g., racial and ethnic minorities, socioeconomically disadvantaged populations, underserved rural populations, and sexual and gender minorities. 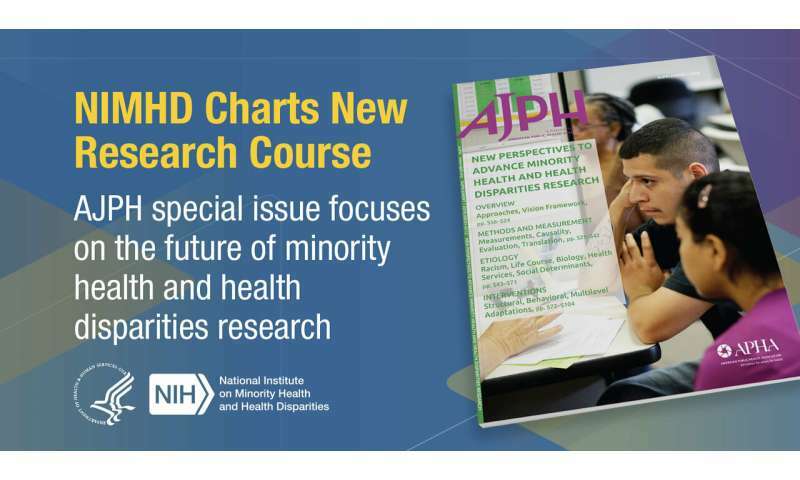 NIH endorses the new research course described in these articles and will use the strategies developed to guide the implementation of the NIH Strategic Plan on Minority Health and Health Disparities in the next five years. The science that will come from advancing these strategies will help enable NIMHD's vision—an America in which all populations will have an equal opportunity to live long, healthy, and productive lives.